This book is also available as an audiobook (read by the author), and there is also an accompanying dvd. In this book, Jeff Foster invites you to forget everything you know, everything you’ve been taught, everything you’ve ever read about spiritual awakening, Oneness, enlightenment, nonduality and Advaita, and to consider a new possibility: the possibility of absolute freedom, right now, right here in the midst of this very ordinary life. Using everyday language and drawing on both personal experience and age-old wisdom, Jeff shares the possibility that all the seeking and longing of the mind can come to an absolute end with the falling-away of the sense of being a separate individual, and a plunge into unconditional love. And in that plunge – which is totally beyond anything you have ever imagined – this so-called ordinary life reveals its great Secret. Written with stunning clarity and aliveness, this book is a love letter to the exhausted spiritual seeker who is simply longing to come Home. At the very heart of this book is the simple, direct and timeless message of nonduality. The word nonduality is often used nowadays to describe the ancient Indian Advaitic tradition of spirituality. It simply means not two and is indicating the essential Oneness of life. There is only one reality – Oneness is all there is and we are included. The book has a deeply caring quality that cannot easily be framed in words. The writing sounds a quiet note of authority that is compelling and commands respect. Nevertheless everyone is free to listen or walk away and Jeff Foster is unequivocal about this. When you are talking about the subject of nonduality, you are always talking about something that cannot be spoken of, he says. It is a truth that cannot be told – it is a plunge into the mystery. This is certainly a liberating message to be explored with an open mind! We do not need to move elsewhere in order to find truth, for it is always present in the clear immediacy of our own direct experience. Truth is always made manifest in the form of whatever is happening moment by moment. It is just this…and this – nothing else. The problem is we are always moving away from what is before us – this is never enough. Neither do we need the endless and exhausting search to attain spiritual freedom – it is already profoundly present within the natural spaciousness of our true being. Yet we do need to recognise and honour this inherent freedom into order to make it our own. What is so rare and remarkable about this book is the particularly clear way in which Jeff leads us carefully step by step to directly experience for ourselves what is true. We need to begin where we are and he sweetly implores us to meet every experience freshly with new eyes. In all sorts of original and creative ways, he asks us repeatedly to meet life head-on without preconceived ideas – and then report what we find. If only such gentle courtesy was always enough to help us see clearly! When you meet Jeff Foster, you encounter someone who is refreshingly natural. He is quite disarming, but he also has an incisive quality of fierce candour, which cuts through evasion and hypocrisy. Life is just too short and precious to waste time in endless disputes about the nature of enlightenment or the rights and wrongs of authentic spiritual practice – and what exactly constitutes the purest non-dual teaching method. He knows full well from his own profound experience that sometimes what is required above all is a courageous resolve to go the whole way – to proceed down the ‘road less travelled’ come what may – until our doubts are finally resolved. We can never do so with our own strength, yet there is no cause for concern, for the strength that we need shall always be provided from the universe to which we naturally belong. Love comes to everyone in the end – and it is a love with no name, which we finally understand has never been absent. they will walk away, and it’s fine either way. Here is a young author, with a wisdom and maturity beyond his years, sharing with his readers a precious secret, which is all too often missed. At the heart of this poetic message is the profound insight that liberation is never far away – it is always present in the midst of so-called ordinary, everyday life. Freedom is everywhere and in everything – there is no division between sacred and secular. It is nothing special and yet… it is somehow there equally in joy and wonder as well as in unutterable sorrow and grievous pain. This is beyond comprehension. It keeps one humble and there are no adequate words for what may be realised. This is not a book to lightly read and put aside. It is a thoughtful and compassionate book to stick with and then dip into again and again – especially if you do not understand some of what it hints at in the beginning. The writing is in turn reflective, comic and challenging with a music all of its own. The gentle harmony gets under your skin and into your very bones, working its insistent magic. This is truly the alchemy of transformation. You see, this is not only about the words – it is more about the resonance of those words. Charged with conviction, such words have the power to call forth a very special quality from deep within us. It is a kind of sweet, nostalgic fragrance – the recognition of something familiar we already know but cannot articulate. It is truth, love and beauty. These are all inspiring terms that point to different aspects of the essential underlying reality, which cannot be named but only pointed to. 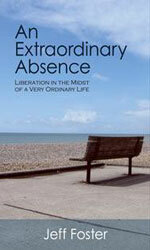 The end of the spiritual search is the clear recognition of ‘an extraordinary absence’. It is the complete absence of separation together with the wondrous discovery of the true presence of the entire world in a love and intimacy beyond anything we have ever known. ‘In writing this book, I wanted to get right to the heart of the matter. I wanted to strip away all the fluff, all the spiritual baggage, all those second-hand concepts we’ve picked up about nonduality, Advaita, awakening, enlightenment, and start again. I wanted to take a fresh look at what nonduality really is – beyond those fancy concepts we have about it – and get right back to the aliveness of everything. Back to life, as it is. Back to reality, as it reveals itself to us. I wanted to write from the heart, to move away from those heady, stale, dry, lifeless words that have used in the past to describe the indescribable, and towards something far more juicy, far more alive, far more loving, in fact. Something more human, more aligned to life, as it is. More – dare I say it – personal; which is a paradox considering that this is ultimately a message that emanates from a clarity that is totally free from the bundle of conditioning known as ‘the person’. This book does not deny any aspect of life. It does not deny our humanness, our humanity, our being-in-the-world but embraces it totally as part of an infinitely bigger picture. It does not reject ‘the person’ as being some sort of ‘mistake’ (as if Oneness made mistakes! ); it does not deny the individual and their apparent existence (and how easily nondual concepts can be used to deny reality! ); it does not attempt to soften, blot out or philosophise-away life as it is…. but it also does not fuel the individual’s seeking by offering false hope or easy, comforting answers. It honours the message of radical nonduality (no person, no path, no time) but it also honours the appearance of the individual in the dream world (person, path, time). It does not reduce nonduality to a simplistic and facile philosophy or belief system. Exactly the opposite, in fact: it urges the reader to see past all philosophies and belief systems, to meet life face-to-face and in that meeting, discover an intimacy beyond words, an absence which is a total, complete, full presence. The concepts of nonduality, Advaita and neo-Advaita simply explode in the face of life as it is, in the face of the rawness of experience, which time and time again I come back to in this book. The rawness of what’s happening – witnessing a loved one being buried, lying in a hospital bed in agonizing pain after an operation – that is real. And that is what this book honours. Be warned – this book is not for the faint hearted. If you like your truth diluted, if you want to be comforted with new spiritual concepts, look elsewhere. But if you are ready to drop all of your knowledge, and see life with fresh eyes, I invite you to An Extraordinary Absence. It’s the book I’ve been wanting to write for years; it’s just taken until now to find the right words.